LED is the latest buzzword in the lighting industry. Looking at the way things are moving, LEDs surely look to revolutionize the lighting market in future. Small bulbs that were used as power indicators for appliances, look to light up the whole living space now. Technology improvements have made LEDs useful for home and office and have also made them much affordable now (still expensive as compare to CFLs or incandescent bulbs). 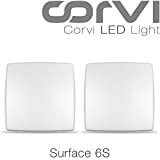 Several manufacturers have come out with luminaires that use LED for lighting. These luminaires are available for all purposes: spot lighting, indoor lighting, outdoor lighting, street lighting, floodlights, garden lighting, general purpose lighting, etc. 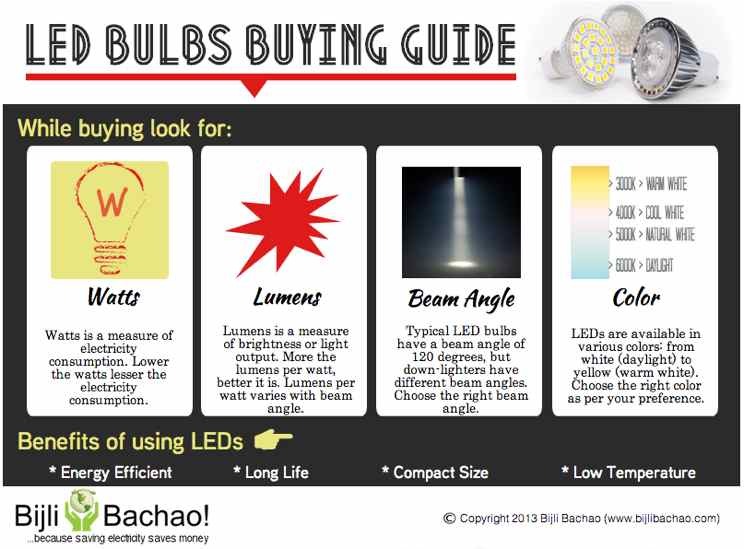 With this guide we would like to provide you information that can help you choose the right kind of LED light for your purpose. What is LED and how it differs from other types of lights? LEDs are a member of type of lighting most commonly referred as solid-state lighting. This type of lights illuminate when current passes through a semi conductor material. They produce more “light” and very less “heat”. In comparison an incandescent bulb lights up when the filament in it heats up. Thus it releases 90% of its electricity as heat. CFLs or tubelights light up when electricity current is passed through tube containing gases. CFLs also release heat but less than incandescent and more than LEDs. The other major difference is that LEDs are unidirectional (or emit light in a specific direction) but incandescent and CFLs emit light in all directions. What are the different parts of LED bulb? Typical LED bulbs contain one or multiple LED chips mounted on a circuit board that is programmed to control the LED lighting. The whole thing is mounted on a heat sink to manage the heat generated from LED. The biggest benefit of using LEDs is their life. They have a life of 25000-50000 hours of usage. So if it is used for 4-5 hours a day, it can run for 15-25 years without needing a change. Good quality LED bulbs are maintenance free. So they are like put it and forget it. They can give better output (brightness) or lumens per watt if beam angles are lower (more on beam angles in the details below). The light output of LEDs remains constant through its life only decreasing towards the end of their life. They do not flicker even when dimmed. Lot of them come with good warranty (of up to 10 years) which means you investment now will last for up to 10 years! They are eco-friendly. They do not use mercury (used in CFLs), which is harmful for environment. What are the drawbacks of LEDs? LEDs are unidirectional or emit light in a specific direction. So they cannot light up the whole area (of a room) unless diffusers and reflectors are used. Thus they are excellent for spot lighting but not as great for general-purpose lighting. Although LED chips have a long life but the life of LED bulbs depend on how well the heat sink and the circuit is designed. A poorly made LED bulb may not last longer than a year (if right heat sink and capacitors are not used: http://www.electronicsweekly.com/blogs/led-lights/2009/02/led-life-expectancy.html). In many countries LED bulbs are rated based on their performance. In India it is better to buy LED of a good brand or buy one that comes with a longer warranty. As we said, LEDs are unidirectional or emit light in a specific direction, it is important to figure out the right spread of a LED light in degrees before using it. This spread is mentioned on LEDs as beam angle. Typical beam angles that are available in the market are 15, 30, 45, 60 and 100 (with some very few with 120 and 180 as well). Beam angles less than 30 are excellent for spotlights. Their output (brightness) or lumens per watt is highest available in the market. Most of them have wattage of less than 5 and are of great use in Shops (where focused lighting is needed on products), Workshops where a specific work is to be done or at homes where specific area has to be focused with decorative lighting. One or more such lights can be used near walls as spotlights. Beam angles greater than 30 are suited for high power LED lamps usually used for downlighting. They can be put on ceiling to illuminate an area in a room. They typically are of more than 5W rating and multiple such downlights are to be used to illuminate a room. A 30-45 degree beam angle is good if the ceiling is high (more than 10-11 ft). If the ceiling is less than that, then it is better to use 60-100 degree beam angle. Based on requirement, multiple such downlighters have to be used and kept 3-4 mts apart from each other to get appropriate lighting. Lower beam angles are also good for outdoor lighting and street lighting purposes where they can be excellent replacement for halogens that consume a lot more electricity as compared to LEDs. Housing societies can benefit by using LED street lights. The increased beam angles are achieved by putting reflectors and diffusors, and the biggest drawback for this is that the lumens (or brightness) decrease as beam angles increase. So a LED bulb with higher beam angle may give same brightness as a CFL for the same wattage. How do some LED bulbs available in market have more than 120 beam angle? Lot of LED bulbs available in the market have diffusors to disperse the light at greater angles. This makes sure that the light spreads across the room. But their brightness will be equivalent to a CFL bulb of same wattage. These are generally designed as replacement for CFLs and incandescent bulbs. The benefit of these bulbs is that they are long lasting and ecofriendly. What other factors should be considered while buying? As we discussed in our article on task based lighting, color temperature of the bulb should be considered based on the mood to be set in the room. LED bulbs are available in various color temperatures: Cool Daylight (White) to Warm White (yellow). Choosing the right one based on the mood to be set in the room is important.